The museum of Science exploring space gallery is situated on the ground floor and contains some of the most fascinating items about space I have ever seen. If you are at all interested in space travel and the technology which gets us there then this gallery will both delight and excite. Space travel began in 1957 when the first satellite was launched, Sputnik ( a replica can be seen of this satellite in the gallery). Since then the human race has launched thousands of ever more sophisticated satellites into space as well giant telescopes designed to explore the depths of space, we have even ventured into space ourselves. 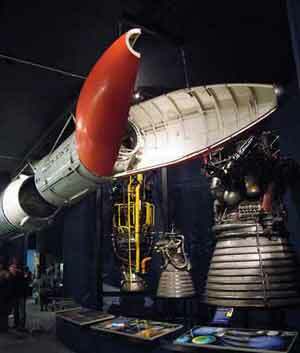 The museum of science in London has many life sized replicas and actual space craft from the beginning of space travel to the present day. The gallery explores the technology which enabled us to break free of earth's gravitational pull and how it is enabling us to discover more about our solar system and beyond. 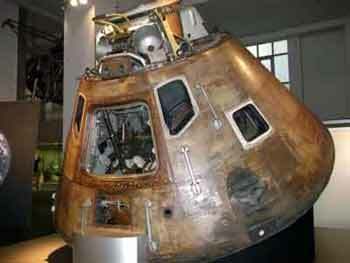 The Eagle - A life sized replica of the famous eagle landing capsule which landed on the moon in 1969 can be seen in the museum of science space gallery. It is quite strange standing next to it and remembering that a craft like this actually landed on the moon. It looks far too flimsy to have been able to withstand anything at all as it seems to be made from tin foil. It is a stark reminder of what a great achievement this actually was back in the sixties. The exhibition which surrounds "The Eagle" describes and illustrates how it is possible to live in space and carry out the everyday mundane tasks such as eating and drinking and even going to the bathroom. It is a fascinating insight into the life of an astronaut. Apollo Ten Capsule - the gallery also contains the actual capsule which travelled around the moon as a dress rehearsal for the actual moon landings. This capsule endured the rigours of returning through the earth's atmosphere containing three astronaut. It is possible to see inside the capsule and just how small a space the astronauts had during re-entry as well as the damage to the underside of the capsule and the heat shield which protected the astronauts as they returned to earth. I think it must have been a very frightening experience to have been those first people to try out the new technology for the first time, not knowing if it would work or not. Black Arrow - hanging above the gallery is Britain's last surviving rocket which launched satellites into space in the 1970's. Its nose cone is open so that you can see how the satellites were released into space. Next to the Black arrow is its American replacement, "The Scout" which continued to launch satellites until 1994. 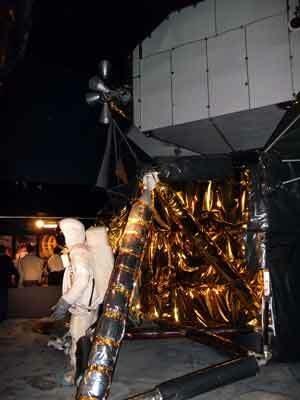 The exploring space gallery also contains some actual sized satellites which have been used in the bath and the present day. These relatively small pieces of technology have served us well and continue to help us understand the earth's changing climate. There is lots of information about what they have been used for and how we continue to use them. Although most of them burn up in the earths atmosphere when their useful life is over, sometimes small fragments of debris is found and some of these fragments can be seen here too. Moon rock - one of the smallest yet compelling objects in the museum of science space gallery is a small piece of actual Moon rock which was brought back in 1971. It is contained in a small glass container which is filled with nitrogen so that it does not come into contact with the earth's atmosphere and become contaminated. The rock was once a part of a lava flow on the moon and was formed billions of years before life on earth had begun. it is amazing to actually get to see something which after all is alien to our world and which has been around for so long. It really does put human life into perspective. This is a very popular gallery and so on the day I attended it was very busy and it was quite difficult to get close to some of the exhibits. My advice is to hang around for a while as with a little patience you can see everything you want to. It is a very impressive space and the museum of science has really made a great display which is easy to navigate round and which covers so much information in easy to understand bites. The gallery is a little dark, I guess this is to add atmosphere but I did find that it was easy to miss certain things, especially those which hung above your head. So do take your time and remember to look up. There is something for everyone here. With lots of written information for adults, and interactive areas for the younger visitor. My favourite aspect to the exploring space gallery is a large seemingly floating globe in the centre the room which is projected onto showing the earth's climates etc and this is accompanied with commentary. This is a fascinating display and I would recommend that you spend some time watching this globe as it does go through lots of changes and you will discover some enthralling things about our planet. The museum of science space gallery really is one of the stars of the show and should not be missed.